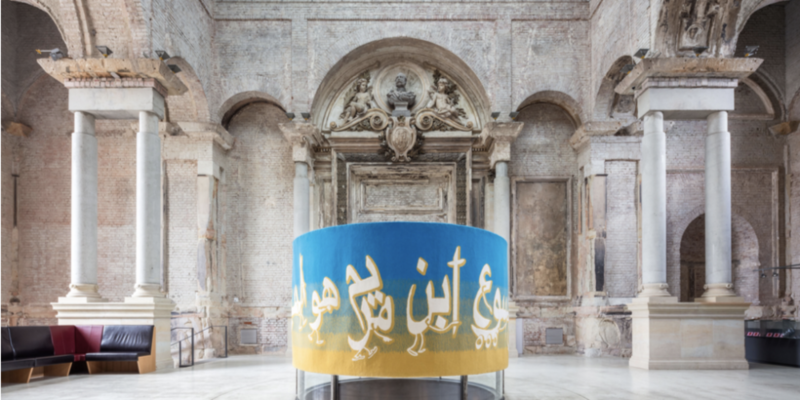 In its research-based works, the collective Slavs and Tatars engages with traditions, customs, language, anthropology and politics in a formal, courageous manner. Their artistic and discursive works revolve around examining belief, religion and intercultural understanding. They describe themselves as a “a faction of polemics and intimacies devoted to an area east of the former Berlin Wall and west of the Great Wall of China, known as Eurasia.” Based on their approach that languages, gestures, rituals and goods have always travelled across the perceived borders between the Orient and the Occident, they research into literary and historical sources, and their humorous but always in-depth works enter into more complex levels of meaning, exploring history, interpretative authority and the performative and political nature of language and identity.